If you’re planning your first holiday with a baby or toddler, there’s a lot more to think about than if you’re planning a holiday away on your own! Finding family-friendly hotels, checking the little one has had all necessary immunisations and ensuring that you’ve packed all the necessary baby travel equipment, there’s a lot to work out. Here are some of the important things to think about when planning to go on holiday with a little one – but remember: you’re the best person to work out what will suit your child. If you believe that he or she will be fine on a long flight, or sleeping in a new place, don’t let anyone else’s advice put you off. Baby-friendly hotels: when booking your holiday, check how baby-friendly your hotel is. From checking the availability of cots and high chairs to finding out about children’s sections in the swimming pool or even whether baby-sitting services are on offer, a good baby-friendly hotel will make your stay so much more relaxed. Small children can find planes either incredibly exciting, or quite scary. The loud noises, unfamiliar environment and even the sensation of having your ears pop can all make a child fearful, so ensure that the little one is calm, and if they’re old enough, explain what will happen. Children often take behavioural cues from their parents, so if you stay calm, they are more likely to. Taking a toddler on a long-haul flight can seem a daunting task; but if you keep the little one entertained, there’s nothing stopping you heading off as far as you desire on holiday. Babies, once in the air, are quite likely to sleep through the bulk of the flight; particularly if your flight coincides with their usual sleeping routine. However, if you do decide to travel long haul, remember that jet lag does affect children too, and they may struggle to deal with the new time zone. This is particularly important as you return from your trip; it can take up to a week to get back into the home routine! It’s also important to think about the type of food on offer in the place you’re headed to. If you have a toddler with a fussy appetite, it’s a good idea to ensure that there will be at least some familiar foods at your destination. For babies, it’s a good idea to take a spare supply of milk or baby-food, especially as changing to a new brand whilst you’re away can cause stomach upsets in your little one. Little ones can struggle to stay hydrated in hot weather if they’re not used to it; when choosing your holiday dates, it is often a good idea to find out the usual temperature of your destination. Going during the slightly cooler times will often mean the baby stays happy – and hydrated – for longer. 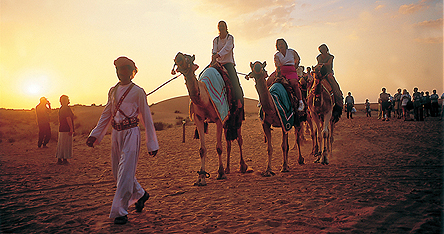 - For a great luxury break with a baby or toddler, Dubai offers a number of five-star hotels which also cater to families. From baby-sitting services to places to feed a little one in comfort, Dubai is fast becoming a popular destination for families. If you choose to stay at Atlantis The Palm, you’ll even find an aquarium within the resort to amaze the little ones! - If you’re planning a short-haul first holiday, Spain offers the perfect blend of warm weather and good food – all just a short plane ride away. With sandy beaches for kids to enjoy and lots of ice cream on offer, Spain has been a family holiday destination for decades. - If you’re looking to go slightly further afield but are wary of a jet-lagged baby, Cape Town may be the answer! With a warm summer, exciting atmosphere and great scenery, it’s an exciting place to visit – and if you book onto an evening flight the little ones shouldn’t be too jet lagged, as it’s only two time zones ahead.